among extant birds. 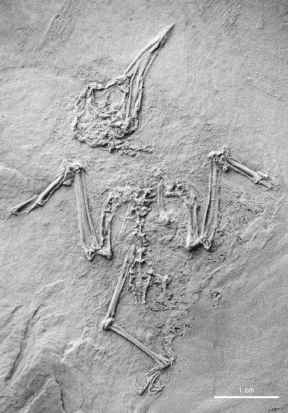 The stout and short humerus and the very long forearm indicate that it may have been an aerial specialist, similar to Apodiformes and the passeri-form Hirundinidae (swallows). Whereas, however, the latter have short legs, the tarsometatarsus of Gracilitarsus is very long and slender. Further, most unusually, the three anterior toes, which bear dorsoventrally deep ungual phalanges, are of nearly equal length owing to the fact that the proximal phalanges of the third and fourth toes are shortened. The alular phalanx of the wing exhibits an unusually well developed ungual phalanx. As in the Sylphornithidae (Sect. 16.9.1), the minor metacarpal distinctly exceeds the major metacarpal distally. Gracilitarsus is, however, distinguished from the likewise tiny and long-legged Sylphornis in the more elongated carpometacarpus, the narrower distal end of the tarsometatarsus, and in that the trochlea for the third toe bears a deep furrow, as in some extant trunk-climbing birds. According to the shape of its beak, which is of similar proportions to that of some short-billed passeriform Nectariniidae (sunbirds), G. mirabilis was probably either insectivorous or nectarivorous. Because of the lack of an extant analog, the peculiar foot morphology is difficult to interpret, but Gracilitarsus may have used its feet for clinging to vertical surfaces, possibly owing to a specialized feeding technique (Mayr 2001g). Given the fact that a similar foot structure, i.e., a greatly elongated tarsometatarsus with rather short anterior toes of subequal length, does not occur in extant birds, it is notable that the coliiform taxon Masillacolius, which also occurs in Messel (Sect. 16.2.2), exhibits a very similar foot morphology. A phylogenetic analysis supported a clade including Gracilitarsidae, Sylphor-nithidae, and crown group Piciformes (Mayr 2005m), but this hypothesis is not yet well established. Gracilitarsidae and modern Piciformes exhibit a distinct notch on the medial side of the sternal end of the coracoid, which was hypothesized to be an apomorphy of Piciformes by Mayr et al. (2003). Manegold (2005) showed, however, that this character has a wider distribution among "higher land birds." 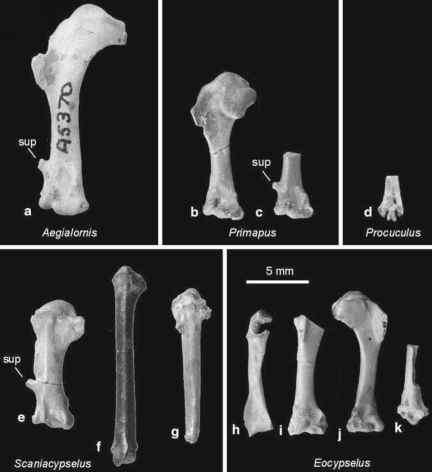 Mayr (2001g, 2005m) compared Gracilitarsus with two other Paleogene birds, Eutreptodactylus itaboraiensis Baird and Vickers-Rich, 1997 from the late Paleocene of Itaborai in Brazil and Neanis schucherti (Shufeldt, 1913) from the early Eocene Green River Formation. E. itaboraiensis is known from a morphologically distinct tarsometatarsus. The bone has a strongly medially projecting trochlea for the second toe and a plantarly directed, wing-like flange on the trochlea for the fourth toe (Baird and Vickers-Rich 1997). The latter feature indicates the presence of semizygodactyl or facultatively zygodactyl feet. Whether or not this feature was present in Gracilitarsus cannot be discerned in the known specimens. However, the tarsometa-tarsus of E. itaboraiensis shares with that of G. mirabilis the presence of a marked furrow on the dorsal surface of the distal end, between the trochleae for the third and fourth toes, and is also similar in overall morphology. E. itaboraiensis was considered to be a representative of the Cuculiformes in the original description, but this hypothesis is only weakly supported by the morphology of the specimen. N. schucherti is based on a wing and pectoral girdle elements from the Green River Formation. The wing shows similar proportions to that of G. mirabilis and the coracoid exhibits a notch in the medial margin of the sternal extremity. N. schucherti was originally described as a passeriform bird, but was considered to be an aerial specialist by Houde and Olson (1989). Although the remains of this species are very similar to the corresponding bones of Gracilitarsus, the discovery of hindlimb elements is needed to ultimately prove the hypothesis of a closer relationship.